Made from GMO free hemp seed grown on silt and peat soil plains under GAP certified farming practices at Ludlow Estate, Ōtāne, Hawkes Bay, New Zealand. Grown without the use of harmful chemicals, Kanapu Hemp Seed Oil contains 1:3 ratio of Omega 3 and Omega 6 considered optimum for human health. It also contains 4%+ Gamma-Linolenic Acid (GLA), which has been shown to help maintain hormonal balance and support menopausal health. The oil has a fabulous nutty flavour with a smooth texture that holds well with red meats or seafood dishes. It can also be used as a dietary supplement, added to smoothies, salads, or used as a condiment served with various dishes. 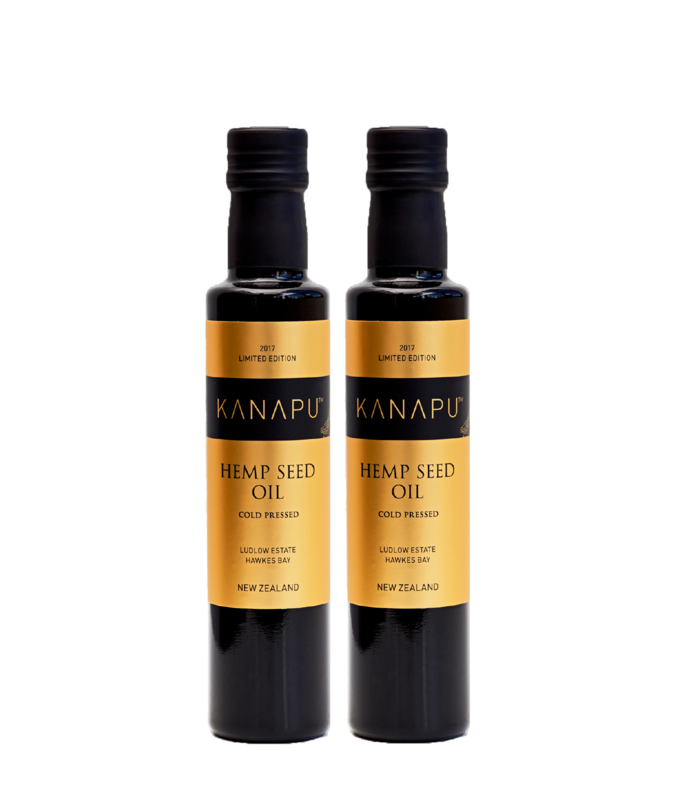 KANAPU® Hemp Seed Oil is an abundant source of Omega 3 and Omega 6 and occurs naturally in a 1:3 ratio considered optimum for human health and a balanced diet. The hemp seed oil has been shown to support immune system health, possess anti-inflammatory properties, reduce risk of heart disease and promote skin health and vitality. KANAPU® Hemp Seed Oil – Harvest Edition 2019 also contains 4%+ Gamma-Linolenic Acid (GLA), which has been shown to help maintain hormonal balance and support menopausal health. Packaged in an elegant 250ml bottle is 15 standard servings of KANAPU® Hemp Seed Oil. The product is grown naturally in Hawkes Bay New Zealand, without the use of pesticides and herbicides, under GAP certified farming practices. The oil has a nutty earth flavour with unique aromas and an outstandingly smooth texture. 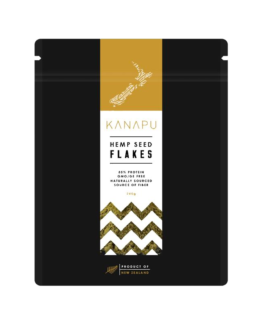 KANAPU® Hemp Seed Oil is used by culinary artisans in Hawkes Bay, New Zealand to create delicious high end dishes. 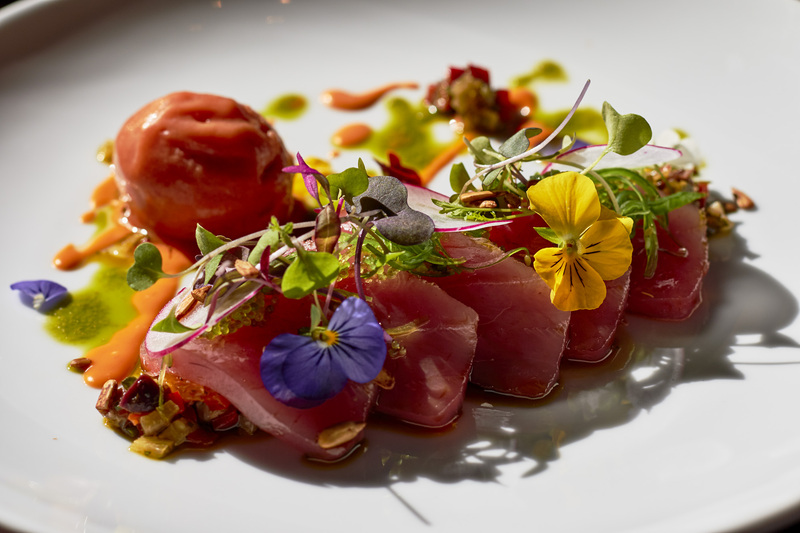 Featured below is a Ginger and KANAPU® Hemp Seed Oil Saku Tuna with Scallop Escabeche, Gazpacho Sorbet prepared by Nathan Beilby – Executive Chef at Vidal, Hawkes Bay.